Gluten Free Plant-Based Sweet Potato Flatbreads. Leftovers can always be fun to work with and today I am sharing with you one of my favorite recipes to make with leftover sweet potatoes. 1 cup of peeled (steamed or boiled) sweet potato variety of your choice. To begin the recipe, gather all the ingredients and organize your work area. Measure and pre-prep your ingredients. Place all the dry ingredients into a mixing bowl and mix until fully incorporated. Make sure to separate 1 tbsp of buckwheat flour into a small container. In a small mixing bowl, mash the leftover cooked sweet potatoes with a fork. Add in the coconut oil. Combine the mashed sweet potatoes with the dry ingredients. If your sweet potatoes are hot to the touch, begin the mixing process with a fork. When cooled, use your clean hands to combine ingredients, until a dough-like consistency is reached. Lightly dust your work area with the remaining 1 tbsp of buckwheat flour and get ready to create some flatbreads! Place the mixture on the board. Divide the dough in 6 to 8 small pieces and roll each into small balls. Dust the pizza roller with some of the flour already in your work area. Place your first small ball on the dusted surface. Roll out for a few moments, turn over to the other side and continue to roll out until flattened. Repeat the procedure until all flatbreads are ready. Add more flour to the board, if necessary. Heat a pan over a medium-high heat. No oil is necessary for this next step. If you feel oil is needed, add 1/2 tsp of coconut oil and thoroughly coat the entire pan. Place your flatbread in the hot pan and allow it to cook for approximately 1 to 2 minutes on one side. Flip the flatbread and cook for an additional 1 to 2 minutes. Note* I always make my own buckwheat flour with white buckwheat groats. This gives me more control of the flavor profile and nutritional content. If you find white buckwheat groats, simply grind 1 cup in a high-speed blender and process to a flour consistency. Once all your flatbreads are cooked, enjoy them with your favorite garlic sauce, fresh vegetables, hummus, soup, or any other dish of your choice. Please share this recipe and give it a like! Also, make sure to check out my new cookbook and thank you so much for your loving support! 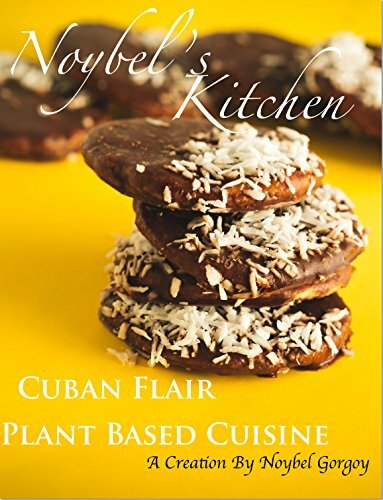 Click the link below for the paperback edition of Noybel's Kitchen Latest cookbook. Click the link below for the Ebook edition of Noybel's Kitchen latest cookbook.